LEGO Ninja Turtles Stealth Shell in Pursuit features dual flick missiles, ooze drum catapult, sewer skimmer and ooze drums. 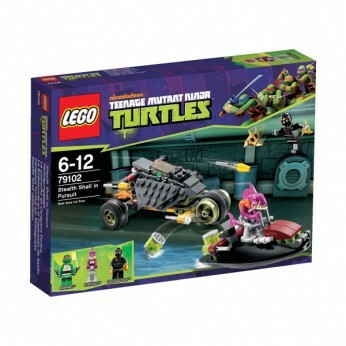 Includes 2 minifigures: Raphael, Foot Soldier and 1 character Fishface…. Fishface is out looking for trouble in this Ninja Turtles LEGO set. Chase him on his ooze-launching sewer skimmer and outwit his reverse flick missiles on Raphael’s Stealth Shell vehicle! With three LEGO minifigures to play with, your little one can create lots of different adventures with this LEGO set. LEGO model number: 79102: Raphael’s Stealth Shell’s tri-wheel design features an impressive dual flame exhaust. Includes Raphael, a foot soldier and Fishface. For ages 6 years and over; EAN: 5702014972162. WARNING(S): Not suitable for children under 3 years old. To be used under the direct supervision of an adult. This toy costs approximately £19.99 (for the latest and best prices make sure you check our retailer list for the LEGO Turtles Stealth Shell in Pursuit 79102 above). In our review of LEGO Turtles Stealth Shell in Pursuit 79102 we classed it as being suitable for ages 4 years, 5 years, 6 years, 7 years, 8 years but recommend you check the manufacturer specific advice before purchasing.